Scallops are delicious. I love seafood and especially scallops. In France, we usually find fresh ones in winter mainly in November and December. But you will find frozen ones all year round. Scallops are often a product that we eat to celebrate something such as Christmas or New Year. It is delicious with a leek fondue for exemple. 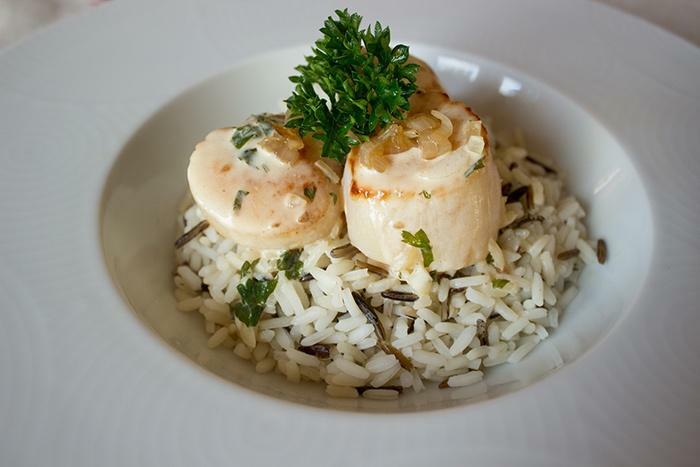 Numerous French chefs associate scallops with mushrooms as well for their famous land and sea meals. If you like seafood, you can be interested in visiting the seafood recipe index. I have also published a seafood bento with scallops that you may like and a delicious verrine with carrot and scallops. I used Brandy for this recipe; but my father usually flambé with Whisky. What do you think? What do you like the most? Peel and dice shallots and garlic. Chop parsley. Melt some butter in a pan. Add shallots and garlic. Bring together ingredients in the middle of the pan and heat up. Pour Brandy and flambé. Add parsley, white wine, cream, salt and pepper. Leave to cook for 5 minutes and reserve. Melt some butter on a pan. Fry scallops on both side keeping the middle transparent. Pour sauce on top of the scallops. Warm up the sauce few seconds and serve. You can associate this recipe with some rice or mashed potatoes. Thank you for reading. Do not hesitate to register to the newsletter or to follow me on social media in order to receive the latest recipes of a French girl “cuisine”. If you liked this recipe, share it with your friend and you may try it sooner than you think :)!